Yeah, but: They're both excellent. 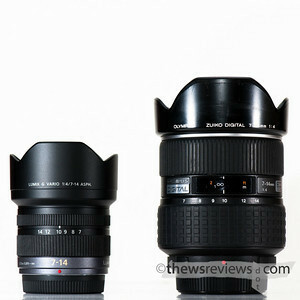 The Long Version: I've been using the Olympus 7-14mm f/4.0 for ages; I reviewed it over a year ago, and gave it pretty good marks. I've only gained the Panasonic 7-14mm f/4.0 quite recently - my full review of it is now online here - and for just a few moments I had the chance to compare both of these awesome lenses. I was looking at four different things: sharpness, distortion, flare, and build quality. The Olympus lens was mounted to the E-3, and the Panasonic was attached to a GH1 shooting in the 4:3 ratio. And no, before anyone says that I should test something else or do something differently, I can't do a re-shoot. I don't own both lenses any more. The first difference between the two lenses is huge: the Olympus is a hefty, imposing lens; the Panasonic puts the micro into Micro Four Thirds. The Olympus is something that really needs to be experienced - it's an awe-inspiring sight. In the hand the lens is absolutely solid and quite heavy, and the build is as good as anything I've ever tried. Even the metal lens cap demands respect: the lens seems destined to produce greatness. The Panasonic is petite by comparison, almost verging on 'cute', with a mostly-plastic construction and smaller lens elements that puts it a full pound lighter than the Olympus. It's an amazing difference, and it's even more incredible to consider that they're both constant f/4.0 zooms feeding the same sensor size. Even beyond the difference in camera mounts, there's such a massive difference in the physical size and build that they're going to appeal to different audiences. 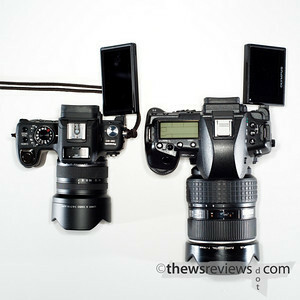 If you want the smallest possible kit for the best wide-angle photography, there's no question that the GH1 (reviewed) and Panasonic 7-14 is the best choice. If you need something that will survive harsh conditions then get an Olympus 7-14 and E-1 or E-3. In fact, this might be the single biggest difference between them, so if size or weatherproofing is most important factor in your choice, skip the rest of this review and just buy the appropriate one. 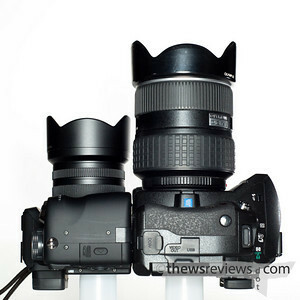 Both lenses share an essential characteristic - big heads and little arms. Getting that huge field of view takes large, protruding front elements, and there's not much that the built-in hoods can do to shade them. This makes both lenses inherently vulnerable to flare, but the Olympus lens does a better job of suppressing it, and it's less prominent when it happens. It's still hard to miss, but not as bad as it easily could be. The Panasonic lens isn't as good, with its flare being brighter and more prominent in the frame.The Panasonic is on the left, and the Olympus is on the right: flare control is a clear win for the bigger lens. What surprised me the most in the comparison was a problem with the Panasonic: the front element attracts dust like spam to a gmail account. With both lenses sitting upright, caps off and side-by-side, and the Panny would have specks of dust on the lens while the Oly element remained clean. It's possible that the majestic dome of the Olympus just sheds dirt through the force of its sheer awesomeness, like an ultrawide Henry Winkler, but I've also noticed that my cleaning cloths don't slide very smoothly across the Panasonic. Its coating is 'grabby', with problematic results. Every little speck of dust, when caught in the wrong light, becomes a source of flare. In all of my time shooting with the Olympus, I'd never noticed this as a problem; with just a week with the Panasonic, it was obvious. With the flare test samples I never wondered which camera I was looking at, while for most other issues I'd have to check the metadata to be sure. Even in these tiny sample photos, dust spots are visible at the edges of the frame. Optical distortion control has also been a traditional strong point for Olympus, and is one way that it's clearly superior to the newer Nikon 14-24/2.8. With the Micro Four Thirds format distortion is corrected on-the-fly within the camera, and Adobe Camera Raw adjusts the raw files automatically. But while the new m4/3 format has finally made it practical, it's not a new idea. Compact cameras have been doing it for some time now, and it was also part of the original 4/3 standards. With the Olympus E-1 the processing power needed for in-camera 'shading correction' made the camera unusably slow, and the distortion correction needed Olympus's own raw converter, which simply wasn't worth the effort. As a result of the combined optical and electronic approach, the Panasonic is almost perfect for almost all of its zoom range. The Olympus needs a maximum '3' value in photoshop's Lens Correction filter, although the actual amount will change depending on the focusing distance and focal length. That's still an excellent result, but the Panasonic has the undeniable advantage of youth. With the Olympus 7-14 review, the only strong optical issue that stood out was a certain amount of corner smearing on the ground when I'd shoot photos from a very low perspective. It's not quite corner softness: imagine a lens traveling through perspective distortion at warp speed, and that's about right. Whatever the actual source of the aberration - I'm absolutely nothing like an optics expert - the Panasonic seems to have less of it. Usually. When it comes to corner softness at more traditional distances, the Panasonic has a slight but slightly more definite edge. (Below, GH1 on the left, E-3 on the right.) That suggests that the amount of software tweaking that's being done to correct lens distortion isn't causing problems elsewhere. When looking at central sharpness, once again the Panasonic wins, but this time it's definitive. There is a huge caveat with the sharpness comparison, though. The Panasonic camera has a slight resolution advantage, which was fairly easy to equalize for comparison, but the true test for sharpness would have had both lenses on a GH1. All that this comparison really shows is that the Olympus camera and lens wasn't showing as much detail as the Panasonic combination once the images had been processed in Lightroom 2. Panasonic bodies have a reputation for delivering more detail than Olympus cameras, and while this test is far from proving that true, it's also far from being a true test of the optics. If someone ever does this test with an adapter to put the lenses on the same body, believe those results instead of mine. I'm always happy to be wrong. I'm going to do something that's very unusual for me: pick a winner in a direct comparison. 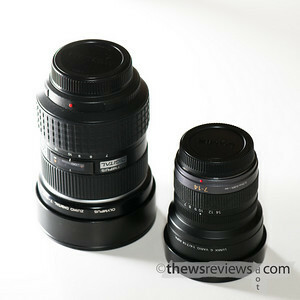 The Panasonic 7-14 is the better lens, or to be more accurate, the GH1+P7-14 mostly beats the E-3+O7-14. Yes, the Panasonic 7-14 gives up the weather sealing and the 'I am a god' feeling that comes with picking up the Olympus lens. 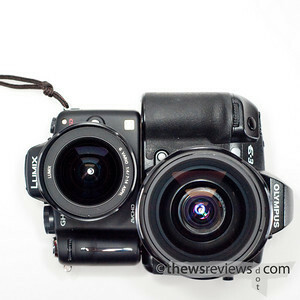 Yes, the Olympus E-1 and E-3 are better cameras than the GH1, even if the newer Panasonic produces better photos. The m4/3 kit comes across as a bit of a toy, a hobbyist's amusement, when they're set side-by-side. But the Panny still wins. It's taken me four days to write this conclusion, and it's not the one I expected to reach. My reasoning behind it is that the Olympus 7-14 is mostly better at things that should be avoided anyway. Weather sealing doesn't include windshield wipers, and worse flare isn't that much worse than regular flare. So while the need to carry a Swiffer for the Panasonic is an annoyance, it's weaker in a situation that all wide-angle photographers already need to be wary of. In exchange, the Panasonic 7-14 is a full pound lighter, possibly sharper, and has zero distortion for everything except the ends of its range. It's also cheaper enough that it'll buy half of a GF1 or Olympus Pen. Naturally, if you're happy and/or heavily invested with Olympus cameras and lenses, their 7-14 remains an exceptional choice. But there is another nagging little issue: competition. Nikon has the 14-24/2.8 for its full-frame cameras, which snags the high end of the market away from the Olympus. There's also the inconceivably awesome Canon 17mm TS-E., which takes the very high end away from Nikon. Coming up soon will be the Sigma 8-16mm lens, which will give a 12/13mm equivalent lens to the great unwashed hordes of APS-C cameras. Unless it's a real lemon, people who really need 114 degree ultrawide coverage won't have any special reason to buy either Panasonic or Olympus cameras - unless they want the small size that's still only possible with Micro Four Thirds. 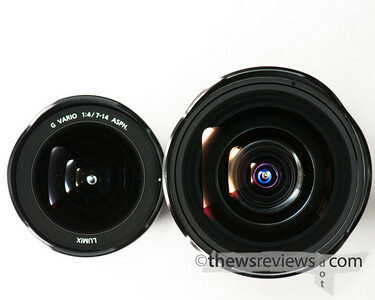 Just three years ago there was absolutely nothing that could match the Olympus 7-14mm for any digital camera system. We live in interesting times. Unfortunately I wanted to know whether the Panny would be acceptable on my E-P2 - i.e should I spend the extra over the new micro 9-18mm! This is, unfortunately, NOT a direct comparison. Sigh. 'Acceptable' is entirely up to you, but the only difference that I can find between Panasonic and Olympus bodies is that the Olympus doesn't automatically remove lateral chromatic aberration. Since I - like every tester I've been able to find - use a Panasonic body, I can't say if this would be an issue or not. As I write this, comparing the Panasonic 7-14 to the M.Zuiko 9-18 is like comparing zebras to unicorns. The biggest difference isn't the colour or the features, it's that only one has been seen in the real world. I have a lot of faith, and I'll have some thoughts on the Olympus once it hits the stores, but I don't expect a lens that costs half as much to be just as good. Different, definitely, and probably more practical, but not better. I have been looking into the getting a micro four-thirds system. Thanks for posting this interesting review (and comparison photos)! You aren't kidding about the size of the Panny 7-14. I just picked one up for my G1 and, wow, one of the best and most exotic wide-angle lenses ever made is barely larger than the petite 14-45 kit lens that came with the camera. Has anyone noticed or is it just me? I feel that the zuiko 7-14 produces colors which are cool blue, while the Lumix colors are 'warmer'. Any take on this? It's certainly possible, but not something that I would have ever noticed - I almost always use auto white balance. I am determined to get my hands on a Zuiko 7-14 for a second-round sharpness comparison, so when I do I'll try it with one of the white balance presets instead. your review was very interesting, but couldn't it be possible that the differences you might have seen are a result of using different bodies? I also owned the E3 an GH1 an must confess, that the pictures of the GH1 adapted with the same zuiko lens sometimes seems to be sharper. It possibly is a question of the better sensor. A new test with the E-M5 (bodie ) + panasonic 7-14 and adapted zuiko 7-14 could be interesting in this case. I'm certain that the different cameras affect the results, especially for sharpness, which is why I put in the huge caveat about that part of the review. 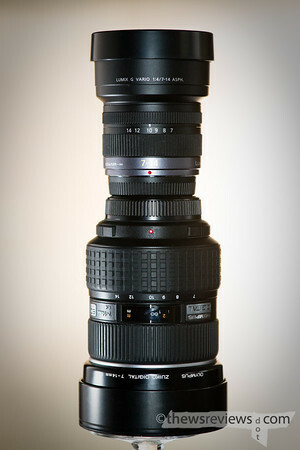 I'd love to have been able to do a direct comparison, but no longer have access to the Olympus 7-14. The good news, in terms of the sharpness comparison, is that both of the cameras used here are now quite dated, and never represented the state-of-the-art in sensor design or resolution. Thus anyone who still has either of these cameras isn't likely to prioritize sharpness – quite rightly, in my opinion; I wouldn't put sharpness in the top three most important lens characteristics. But if acuity and resolution are the goal, then there are much better cameras, and much better systems, than the ones used here.